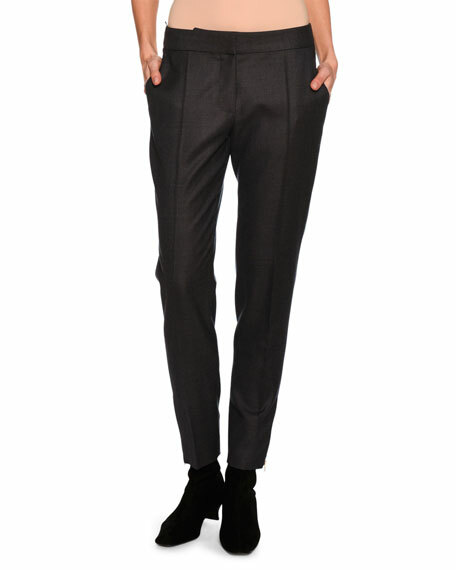 Stella McCartney "Vivian" open-weave trousers. Slim fit; skinny, tapered leg. 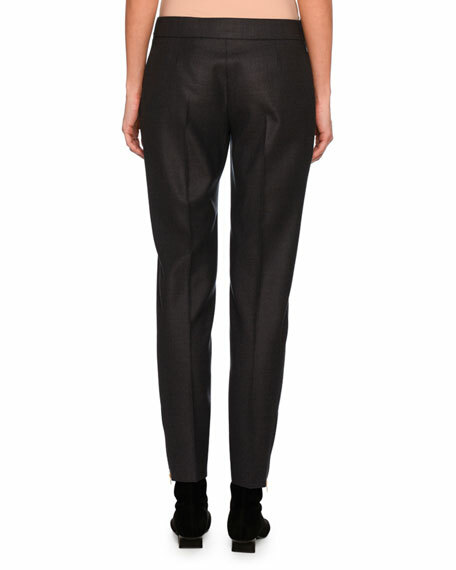 Derek Lam 10 Crosby crepe trousers. Approx. measurements: 9" rise; 34" inseam; 43" outseam. Mid-rise; concealed hook/zip fly. Side slip pockets; back besom pockets. Slim fit; flared legs. Cotton/acrylic/nylon/polyester. Dry clean only. Imported. Model's measurements: Height 5'11"/180cm, bust 32"/81cm, waist 24"/61cm, hips 35"/89cm, dress size US 2. Lela Rose "Maggie" pants in stretch wool. High rise. Side slip pockets; back welt pockets. Straight, wide fit through legs. Lela Rose "Maggie" pants in stretch wool. High rise. Side slip pockets; back welt pockets. Straight, wide fit through legs. Floor length. Hook/zip front. Wool/nylon/spandex. Made in USA of Italian materials. Model's measurements: Height 5'11"/180cm, bust 31"/79cm, waist 23"/58cm, hips 34.5"/87cm, dress size US 0/2.